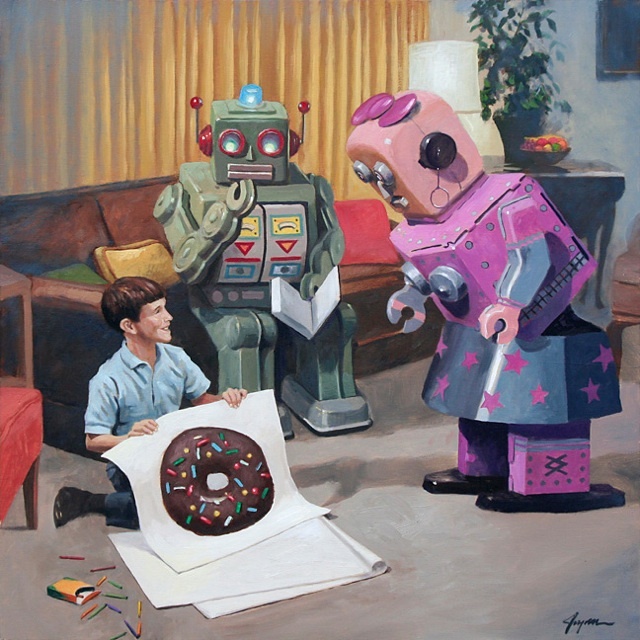 Eric Joyner has a new solo art show “Donut Logic” at Corey Helford Gallery in Culver City, CA. The show, which features his fabulous painting of robots, donuts and cupcakes, opens on Saturday, August 14th and runs through September 1st. For his third solo exhibition at the gallery, Eric Joyner unveils a bold new twist to his decade-long odyssey of donuts and robots. Exploring new territories, Joyner’s metal humanoids reveal the secret life of robots: they sport tattoos, balance careers and families, and expose their hidden desires. “Donut Logic” will also debut the addition of cupcakes to Joyner’s signature glazed landscapes.